L'article a été vendu.Cet article a été vendu pour CHF 1'096.00. Direct Time! Art Deco! Unusual Timepiece! Complication! Top! 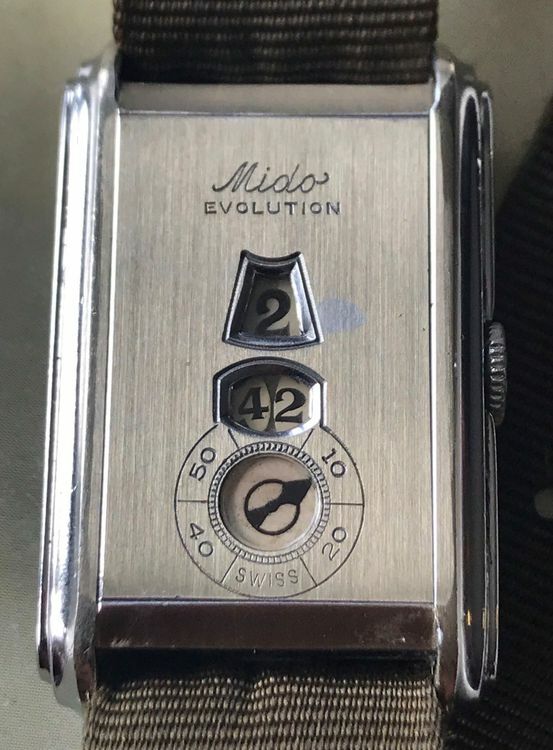 Very nice and all original vintage art deco 1930 MIDO EVOLUTION direct time digital jump hour mens watch! Super rare sub second digital jump hour direct time complication from Mido, called the « evolution ». The watch is unpolished with a chromed with stainless steel caseback of 23mm diameter and with hinged snap back. 36mm from lug to lug. Fixed bars! Super nice and great condition for an Art Deco 1930s watch. Please refer to clear pictures. Really top condition! The watch works and seems to keep accurate time but has not been timed or tested for accuracy. Manual-winding movement MIDO calibre with direct time « jump hour » complication. Comes on a new olive green nylon vintage strap! The watch is guaranteed original and authentic MIDO swiss made product.